Is Pennsylvania Ready for a Woman Governor – Yes, if Laura Ellsworth has anything to say about it! t’s a ‘man’s world’ … or is it? Although Pennsylvania has never had a woman governor, that may change if Republican Laura Ellsworth, a commercial litigation attorney from Pittsburgh, has anything to say about it. On May 15, voters will choose among three Republican candidates for governor. Governor Tom Wolf is unopposed in the Democratic primary. In addition to Ellsworth, Paul Mango, a former health care systems consultant from suburban Pittsburgh and Scott Wagner, a state senator from suburban York who owns the $65 billion waste hauler Penn Waste Inc., are also running in the Republican primary race. Candidates Mango and Wagner are spending a lot of money fighting over who is more conservative, whereas Ellsworth is seeking broader, less ideological support from voters. Today I took my daily walk from the Chester Valley Trail to Wilson Farm Park so as to meet the sole female governor candidate Republican Laura Ellsworth, who stopped by the park for an hour long meet and greet with the locals. One of the residents in attendance asked Ellsworth if she voted for Donald Trump in the last election – without skipping a beat, she responded with a firm NO. In reviewing a Philadelphia Inquirer article, I read that Ellsworth “backed John Kasich for president (says she wrote in his name in last year’s election), gave money to Barack Obama, Hillary Clinton, and Sen. Bob Casey — and doesn’t like political labels”. It was clear today that she wasn’t touting party politics but instead representing herself as a candidate for “all” the people. Endorsed by the Philadelphia Inquirer this morning, I also learned that Ellsworth supports universal background checks for gun ownership and the banning of bump stocks, which are devices that allow semi-automatic weapons to fire more rapidly in addition to raising the age of gun purchase to 21 and imposing a three-day waiting period. Now in his fourth year as governor of Pennsylvania, Tom Wolf wants another four years. The only female candidate in the governor’s race, Laura Ellsworth hopes to be the Republican Party’s nomination to challenge the Democratic governor. But first things first – Ellsworth needs to win the May 15th primary and her Republican rivals, Wagner and Mango, are not going to make the task easy. I have to say – having a conversation with Laura Ellsworth today was like talking to a next-door neighbor over the back yard fence. 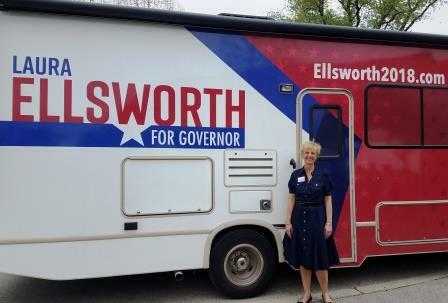 Although she has never run for public office, Ellswoth’s friendly and confident responses to the residents make her a natural in her new role as candidate for governor. Laura Ellsworth exudes a very genuine quality with a welcoming voice in the midst of partisan politics.